Beaducation offers a variety of hammers for sale. Each hammer has a specific purpose for metalworking and stamping. Refer to the table below to choose the correct hammer for the correct technique. The 1 lb Brass Head Hammer is the tool of choice for striking design and letter stamps. The weight of the hammer gives an even and clear impression. Since this hammer is made of brass, the face of the hammer will get dinged up and possibly flake a bit. This is normal wear and tear and not a defect in the tool. A Brass Hammer does not have "bounce back" and is similar to the dead blow hammer in that respect. Household hammers are not as dense as the brass and therefore will have bounce back which will result in a blurry stamped image. The 2 lb Brass Head Hammer will provide a heavier blow behind the strike on a design stamp. If the stamp has a more complex design, it may transfer to the metal better with a heavier hammer. The Plastic Mallet forms metal without marking it. It is perfect for shaping metal around a mandrel or tapping blanks flat after stamping. The Rawhide mallet features a heavy 2" head made of rolled rawhide and coated with shellac. This mallet is perfect for shaping and flattening metals when a softer blow is needed. The head will become softer over time. To speed up the process, the mallet head can be soaked in water and pounded against the pavement. The round face riveting hammer is a smaller, lighter hammer. This hammer is perfect for riveting using smaller gauge wire. The tapered end is perfect for texturing metal. The surface of this hammer can be easily marred. Do not use it for any other purpose than riveting. The square face riveting hammer is a heavier, harder working hammer. The head is made of hardened steel and works well for heavier gauge rivets. This hammer is meant for riveting. Do not use to strike design stamps. A Chasing Hammer forms, flattens and shapes metal including wire, wire strip and sheet. The flat head of the hammer is slightly convex to prevent the rim of the hammer from marring the metal. The ball end of the hammer can be used for making a dimpled surface on the metal. Although the initial intent of this hammer was to lightly hit design stamps, we like to keep the face pristine and smooth for forging metal. For modern metal stamping, a brass mallet is best. Fretz manufactures high-end hammers with precision milled heads and Padauk wood handles. These are the "Rolls Royce" of the hammer world. 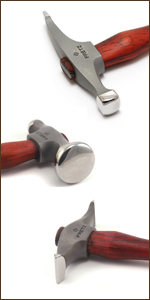 Click on the following links to learn more about each hammer.